Today is the feast day of St. Francis of Assisi. 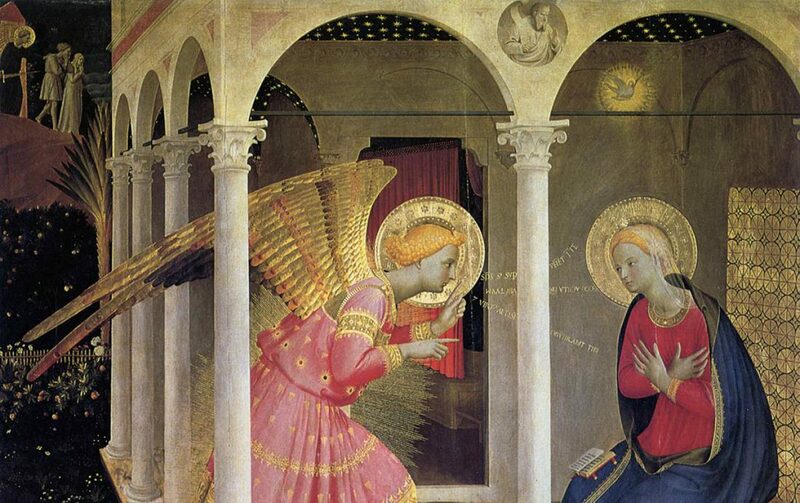 He is one of the patrons of the Fra Angelico Institute for the Sacred Arts. St. Francis reminds us how we admire, and should emulate, the virtues of the saints. When we meditate on the life of St. Francis – three characteristics of spirit – three virtues – emerge. He realized that “to be simple is to see things with the eyes of God. St. Francis pursued simplicity because he innately knew that God Himself is simple” (Fr. Ronald Knox 1936). Other characteristics of Francis’ life are the virtues of faith and love. St. Francis understood that by increasing his faith, by praying for faith, by acting faithfully and lovingly, his spiritual muscles would be stressed, and as a result, he would grow stronger in faith and life. Giotto (1226-1337), born the same year St. Francis died, painted these virtues of St. Francis at work when he portrays Pope Innocent III’s dream of Francis holding up the pillars of the Church. It was St. Francis, and his fellow friars, that would promote, and live in their daily lives, the virtues of poverty, chastity, and obedience that would sweep the imagination of Europe and even gain the respect of the Eastern world. One of my favorite stories about him that also illustrates this point occurred in the year 1219 – during the Fifth Crusade; Francis traveled to the Holy Land – where he was captured and beaten by the Muslims. St. Bonaventure tells us in his history of the Franciscan Order that St. Francis was brought before the sultan Al Kamil, and preached to him about love and the meaning of Jesus’ life. When he finished his sermon he then challenged the Sultan’s imams to a religious test to determine which was the true religion – Islam or Catholicism. The painting below, entitled Trial by Fire by Giotto, illustrates the drama of this moment. The Sultan’s eyes lit up – now this is a man of faith. His imams, however, felt that they had better things to do. But from that moment on Al Kamil was so impressed with Francis that he gave the Franciscans safe passage to travel and stay unhindered – anywhere – in Muslim occupied territories; and as a direct result of this act, eight hundred years later, if you go to Jerusalem you will see that the Franciscans are still the Catholic Religious Order responsible for the maintenance of the shrines in the Holy Land. Theologian Dr. Marcellino D’Ambrosio teaches us that “St. Thomas Aquinas explains that a virtue, like a physical muscle, is a habit – a power or capacity – that gets stronger when its exercised – and atrophies – when it is not;” and St. Francis, tells us that faith and love – prayer and service are the main muscles in our spiritual body. Francis refused to let his spiritual muscles become weak. He exercised them regularly, we could say heroically, so that he would be able to endure all the tests, all the trials, that life presented to him. We need to ask ourselves, however, how did he do it? How did he exercise his spiritual muscles? The answer is that he balanced himself. He was in harmony with the Lord, and, with himself as a person. He achieved this balance by harmonizing his active life (the life of an ordained deacon serving within the world) with the life of the Spirit (prayer, the Liturgy of the Hours, contemplation, Penance, and the Eucharist). Like the holy Gospel account of Martha and Mary, he imitated the Lord’s understanding by seeing that both were correct, service and prayer, both had their place and both were absolutely essential – especially prayer. What a wonderful witness he is to us. His life and work always has something to teach, and challenge us, to greater acts of simplicity, service, prayer and love in our own lives. As sacred artists we should be humble enough to study and learn from sacred artists who have come before us, but most importantly, we need to study sacred artists that are balanced in their spiritual and artistic lives. One artist that we need to study is Giotto because he is a wonderful example of a sacred artist that combined the principles of action and contemplation. He was balanced. He achieved simplicity in his portrayal of spiritual truths, and as a result, was able to witness to us the need for continual dedication to strive, within our own spiritual and artistic traditions, to serve the Lord and our fellow man by expressing beauty through our sacred art. St. Francis of Assisi pray for us.